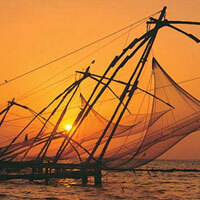 Arrive Cochin airport and meeting and assistance upon arrival and transfer to hotel. Overnight at the hotel. Morning city tour including visit to Jew Town, the Chinese fishing nets and St Francis Church, which dates back to 1503. Continue to Mattancherry Palace, a gift from the Portuguese to the raja of Cochin in 1515. Later this afternoon, visit the Kathakali dance studio where you will have access to the artist’s dressing room and a short demo on the elaborate make-up that this dance form is renowned for. Overnight at the hotel. Morning drive through the Western Ghats to Thekkady, a beautiful area of tea gardens, rubber estates and coffee and pepper plantations, located high in the Cardamom hills. In the afternoon, visit a spice garden where you will be introduced to different spices and shown how some of the spices are grown. Overnight at the hotel. In the morning drive to Kumarakom. En route you will visit a working tea estate, where you will have the opportunity to learn how tea is grown, graded, the various processes involved in the production of tea and an introduction to tea tasting. Continue drive to Kumarakom and check-in at the hotel. Evening is free for individual activities. Overnight at the hotel. Morning drive to Alleppey for a motorboat cruise through the narrow canals and inland waterways, seeing rural life that has changed very little over the centuries. Overnight at the hotel. Drive to the coastal resort of Kovalam. Upon arrival check-in at the hotel. Rest of the day is free for individual activities. Overnight at the hotel. Day free for relaxation and individual activities. Overnight at the hotel. Morning transfer to Trivandrum airport to connect flight for onward destination.